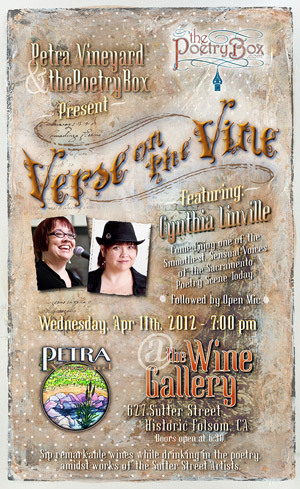 We’re proud to announce that our featured poet for April 11th is Cynthia Linville. Cynthia teaches writing at California State University at Sacramento and frequently hosts and reads at poetry events both on her own and with Poetica Erotica. Her book of collected poems, The Lost Thing, is forthcoming from Cold River Press. A music aficionado with a theater background, she is usually out and about supporting the arts in Sacramento and in the San Francisco Bay Area.